Do you need banners for your Pack when you participate in parades or for Summer Camp or maybe to help your Scouts learn the Scout Law and Scout Oath? We have banners that can be hung from a pole, or attached to a easel or wall. All awards are custom made to your requirements and specifications. Our normal shipment method is UPS ground. APO shipments are by USPS. If you need Cub Scout Raingutter Regatta® trophies, just click here. Just click here for the Cub Scout Space Derby® awards we have. 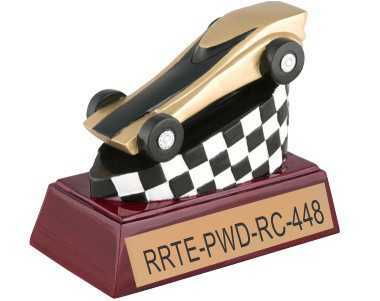 Have some questions about ordering your Pinewood Derby® trophies, check out the FAQs. There is no damage to the car. You can remove the car and race or continue to play with it. You can even modify your existing trophies to so will also display cars. Just call for details. 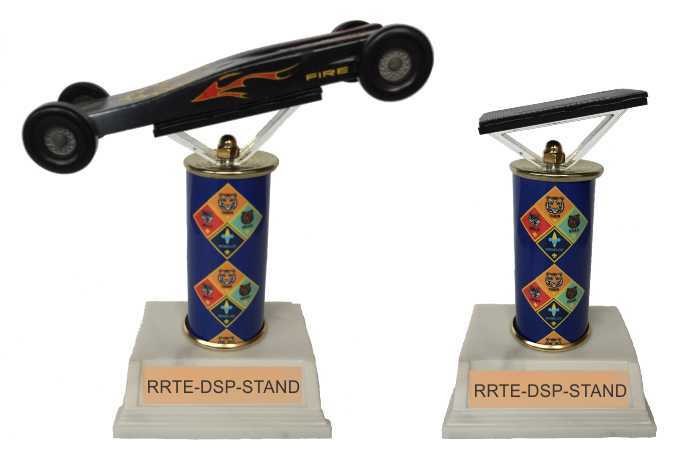 Cub Scout Pinewood Derby® Trophies with Cub Scout themed columns - The ranks are on the columns. ** ==> Denotes the column. Just call 903-463-4018 or email info@redrivertrophy.com to place an order or have your questions answered. These trophies have a Placement trim for 1st through 5th Place. We also have Pinewood Derby medals and ribbons. We will also customize your Pinewood Derby ribbons with your Pack or District. Boy Scouts of America®, BSA® Universal Emblem, Cub Scouts® and Cub Scout(TM) Program Logo, and all other related marks, are either registered trademarks or trademarks of Boy Scouts of America in the United States and/or other countries. All other trademarks are the property of their respective owners.